With the strikes impacting our study independent work is – sadly- more important than ever. So this means we have to probably start trying now! Ew. I have four exams this year and as I’m in third year they have never been more important. This calls for a sense of the what I like to call ‘rapid overpreparedness’. Three of my four exams are in the first week of exam period *sigh*, and this means I have to have prepared for all three of them by the first day because (although it works for some) last minute revision is not really my thing. I tend to enter into stress induced panic over the Easter holidays knowing there’s not much time left (other assessments like essays don’t help to be honest). Firstly sorting out each module, seeing how long the exam is. Seeing what topics have come up in past papers and looking into how few topics I can get away with learning (usually 3- 2 in detail and 1 that is more general that I can shape to fit the question). 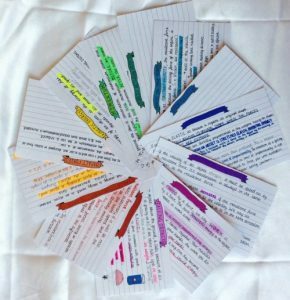 Then I go about making revision cards- not only do these help you remember key names, dates and theories but it is a way you can concisely reduce your workload down to a pile of cards that have all the info you need. Plus the use of different coloured pens is just fun and having a stack of cards makes me feel productive. Now comes the hard bit- you’ve written down all you need to know, all the key names and dates in different fonts and now all you have to do is remember them. It takes time and repetition, you will get sick of these cards but it’s the only way you’ll remember them. Look at one side and it may say ‘Foucault’ and you will train your brain to remember the theory on the other side. If the card contains a lot of information I tend to make a mnemonic and put it on the front and this will make it easier when you try to remember them in the exam. Count how many cards you have for each exam- in the space of paper where you plan if I know I have 13 cards for that exam I’ll try and write out- practically in shorthand, what they were. Then when I’m structuring my essay I can cross each one off knowing I’ve included all the information I revised. 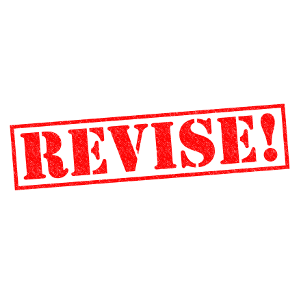 Obviously revision doesn’t have to be dreaded- get a cuppa and a pack of Jaffa cakes and go over those cards, have music on if that helps you and remember to take breaks ever 20 minutes.